The Anne Frank House in Amsterdam had a record number of visitors for the seventh consecutive year. 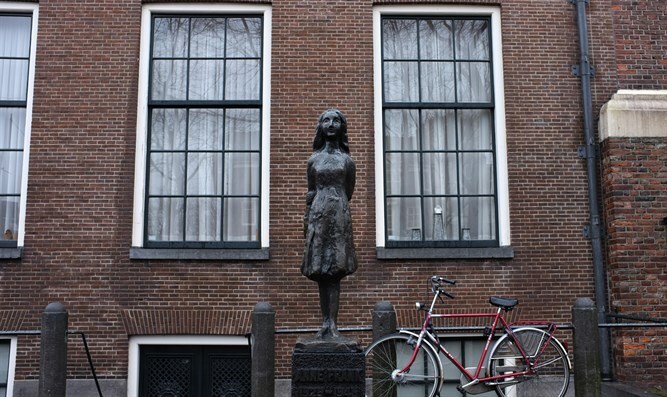 In 2016, nearly 1.3 million people visited the Anne Frank House, located at the site where the teenage diarist hid from the Nazis with her family, according to a statement from the memorial site. This year's number was 27,490 more than the record set in 2015. “The connection that these people feel with Anne Frank and her life story is always moving and inspiring,” Ronald Leopold, executive director of the Anne Frank House, said in a statement. The Anne Frank House also organizes educational projects worldwide, exposing millions more -- most of them young -- to the life story of the young diarist. "The life story of Anne Frank motivates young people to reflect on the social developments of then and now, and inspires them to combat prejudice and discrimination in their own surroundings. That gives hope,” Leopold said. The diary, which chronicles two years of hiding from the Nazis in an Amsterdam attic, may be the most famous Holocaust-era document and has inspired several play and film adaptations. Anne died in 1945 at the Bergen-Belsen extermination camp.